LP version. Benin International Music pays tribute to the music of the forebears of Dahomey. It reflects as much the traditional ceremonies as the trendy clubs of Cotonou, through to the Evangelical churches and the convents where voodoo deities are invoked. Associating voodoo rhythms and traditional songs, electronic melodies in the very spicy Beninese style with trip pop grooves, hip hop, and rock, this collective of Beninese artists has all it takes to make you travel. 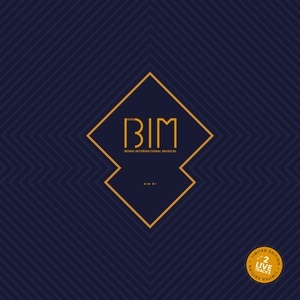 Initiated by Hervé Riesen, deputy director at the channels and contents Department in Radio France and Chairman of the EBU Eurosonic Group (European Broadcasting Union), BIM is a musical and radio project. Jérôme Ettinger, producer who made the album (World Tour Records, artistic director at Togezer Productions) is also a composer. Personnel: Jimmyl Tchegnon (Jimmy Belah) - singing, drums, percussion; Brigitte KITI (Amessiamey) - singing, castanets; Yelouassi Nadège (Nayel Hoxo) - singing, castanets; Jean Gbètognon (Yewhe Yeton) - singing, percussion; Boni Obinti (Lionel) - bass, singing, percussion; Totin Emile (Resnikpa) - percussion; Yaovi Emmanuel Atcho - guitar, singing.